In the first part of this blog series, we looked at the first half of our favorite digital marketing campaigns of 2017 and in the concluding post, we will be listing the remaining five. It was a near impossible task to select just ten, so if we have missed you, try not to think too badly of us! London Metropolitan University has a diverse student body, an unbeatable central London location and a proven commitment to employability. 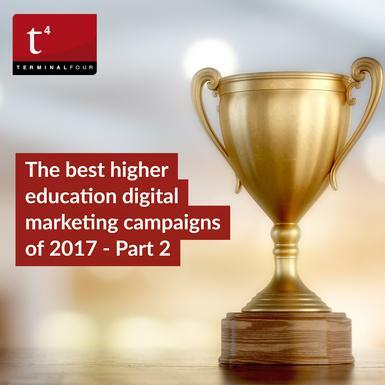 The university have placed these strengths at the heart of their video marketing campaign that includes a TV advert as well as faculty and social media films. They wanted to create a campaign that would reflect the diversity of the university's student body. The concept was then chosen, using a poetic narrative that would chronicle three students' personal journeys, allowing the film to reflect the main student demographics that the university wanted to target. The finished result is simple yet stunning with the vibrant backdrop of the city of London playing the role of the university's extended campus and the diversity of students, courses and opportunities well represented. Read the full blog post on this striking campaign here. 8. Higher Ed Social: The best highered podcast of 2017? Last year, one of the most invaluable resources we came across is the Higher Ed Social podcast from Lougan Bishop (Belmont University) and Jackie Vetrano (Skidmore College). They podcast bi-weekly and their show is dedicated entirely to those who work in higher education. Each episode, they explore the lives and careers of people who help make colleges and universities work. You can listen to the full catalog of podcasts here http://highered.social/ and check out our original post here. We found this quite by accident last year though I believe it's actually been around since 2011. We're making a special exception however, because it's just so ridiculously clever. One of our favorite posts to stumble across on Facebook, Twitter or Instagram are posts where we get a glimpse of what life was like for past students. The Special Collections staff at University of Nevada, Reno spent a long time researching the lives of two students who met and married after attending the university in the early 20th century. They decided to bring these two past students to life by setting up two Facebook pages for the couple. When I came across this, I just thought, how completely original and fascinating. The current political climate is having a major effect on how universities recruit international students. Our fourth annual Higher Education Digital Marketing and Web Survey for 2017, which surveyed 391 higher education professionals from 333 universities and colleges around the globe, showed that 56% of higher education institutions will struggle to meet recruitment targets due to visa/travel restrictions.